Here at Whisky Boys HQ we received a fabulous selection from Gordon & Macphail which included two 2018 Whiskies from their New Private Collection. The Private Collection features some very rare Whiskies, which have been specially selected and bottled by the Urquhart family who have been the owners of Gordon & Macphail for four generations. Inverleven 1985 – 33 years old This one is of particular interest as this lowland distillery was built in the lat 1930s then mothballed in 1991 and demolished in 2006, so when a bottle is opened and enjoyed it is one less from this distillery. First up is the Glenrothes. 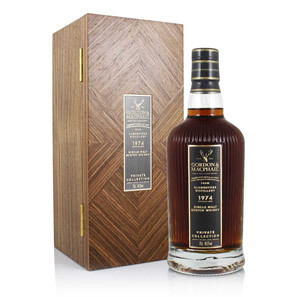 Glenrothes 1974 – Speyside Single Malt Scotch Whisky, Refill Sherry Puncheon, 49.5% Alc/vol. 70cl, one of 276 bottles, bottled July 2018. Nose… Really complex, sherry soaked sultanas, molten fudge, underneath the gooey sweetness is chopped citrus peel and a hint of oak spice. 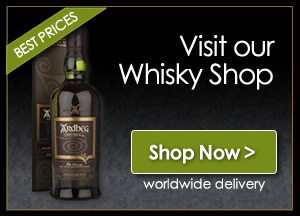 Taste… Full-on, mouth-flooding warmth, rich, deep and unctuous, in comes a hint of tobacco, chocolate, Christmas notes of fruit cake, cinnamon, walnuts, ginger and orange zest, sticky toffee pudding, a very welcoming dram. Finish… Medium to long finish, elegant, juicy and sweet, now a little drying. Well, this is an outstanding old sherried dram, this one is priced at £1250.00 so maybe just for some special occasions. Once again at G&M have another special Whisky on their hands, I don’t expect this will be on their shelves for very long, worth every penny. Next up is the Inverleven. 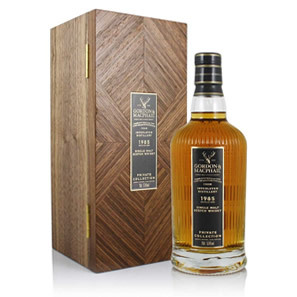 Inverleven 1985 – Lowland Single Malt Scotch Whisky, Refill Bourbon Barrel, 57.4% Alc /vol, 70cl, one of 130 bottles, bottled July 2018. Nose… A tropical fruit salad with pineapple, mango, papaya and kiwi, poached pear with vanilla ice cream. Taste… A bitter-sweet bounty of sugared almonds, damson jam and chilli chocolate, in the background is oak, ginger, nutmeg and cloves, trifle pudding and custard, coconut. Finish… A bright tropical fruit finish, chocolate orange with burnt toffee served on a oak cask stave. Wow, another stonker from G&M. This one is priced at £1000.00 and limited to 130 bottles, this one is going to be the highlight of many a collection. Also in the package from G&M was a selection of their Connoisseurs Choice. I now have the pleasure of tasting the following. For me the most interesting one is the Tormore, one of my all time favourite distilleries and Whiskies.